Where do I get a National Forest Adventure Pass? Please note: We will drive from here to our location where we will be starting our hike. We will be parking in a residential neighborhood and start from here. HIKE WALK-THROUGH: We will start from a residential neighborhood located up in the hills. It’s a designated single track dirt trail that starts off leading into a wide fire road. We will descend through rolling hills with spectacular views of the city. It’s a hidden trail and mostly traveled by locals in the area. The Skyline Trail, under the jurisdiction of the Los Angeles County Parks Department, extends through the canyons and over the mustard-covered crests of the hills. 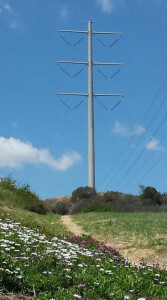 We will be hiking to the top of electrical towers and turning around here. All the options offer fine clear-day views of the metropolis from scenic overlooks on both sides of Whittier and Hacienda Heights. RESTROOMS: There are no restrooms on the trail. So please take advantage and use the restroom at our meet up location first. WATER REQUIRED. WATER CHECK WILL BE PERFORMED. If you do not take enough water or are not appropriately equipped for this hike, you will be turned away from doing this hike with us even if you show up. Please note, that we have expectations for Level 3 hikers. Read all the details. REQUIREMENTS: WATER (at least 1.5 to 2 liters or three 20oz water bottles), 2 liters recommended. Comfortable hiking/sports shoes with good grip. Hiking sandals ok. RECOMMENDED: A good snack and comfortable walking shoes. Try to pack lightly as you’ll be using plenty of your energy. Hiking sticks a plus. IS IT DOG-FRIENDLY? Yes, experienced/friendly. Dogs must be on a leash! You must pick up after your dog. Bring separate water and snacks for your dog as well. 1. Read the Hike’s Details we link at the very top of this page. 2. Make sure that the Hike Level accommodates your hiking experience. 3. If, and only if it suits you, then RSVP for this event and show up the day of the hike with all necessary gear and water (we mention everything you need on the details page for this hike). MY FRIEND SAID I CAN DO THIS HIKE, I SHOULD BE ABLE TO DO IT, RIGHT? We take your safety quite seriously, and would not like for you to attend a hike you’re not ready for. You know your body and hiking experience better than your friends. Whether you are a first-timer or an experienced hiker, please read our hike details page as the hike may not suite your experience level. We have a better experience if every hike has hikers of the intended level. DISCLAIMER: LA Trail Hikers and its Leads/Organizers/Participants do not take responsibility for any harm,bodily injury, accidents, or damage to personal property. By clicking “Attending,” or attending the hike, you confirming that you understand that all outdoor activity such as hiking, backpacking, and trekking have an associated danger, and will not hold any hike lead/organizer, participant, LA Trail Hikers, or any group associated pet responsible for any hazard to your well being. Additionally, you will not be allowed to participate with the group if you are not adequately prepared with enough water and the right gear/equipment/nutrition essential to complete the hike. You are fully responsible for yourself.